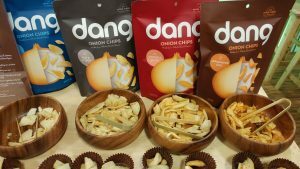 From the January show floor…outstanding real-onion crispy treats, the grown-up Funyuns you’ve been waiting for! When I saw the information yesterday about this year’s awards from the Specialty Food Association, my eyes glanced quickly passed the baking mixes and chocolates, proceeding down the page to my pet subjects (I was going to say “pet foods” but that sounded just not quite right…): salty-crunchy things and other savory treats. Which echoes pretty much exactly how I chart my visits to the organization’s two annual trade shows, the huge January version in San Francisco, and the even huger show each summer in New York. Not that I put blinders on exactly–because serendipity of an unexpected delicious sample is always a good thing. But to help me stay focused and avoid it taking an hour to go down each lengthy aisle, I have my radar out for the categories I love most. The association’s “sofi” awards (specialty outstanding food innovation) have been handed out for over forty years now, this organization clearly a longtime participant in the specialty food realm. I went to their shows a few times in the 1990s, while I was editor of Simply Seafood magazine, with an eye out for any/all seafood products and seafood-friendly condiments and snacks. Which are still on radar today, plus the additions of crackers and other savory snacks, cheesy items, butter. 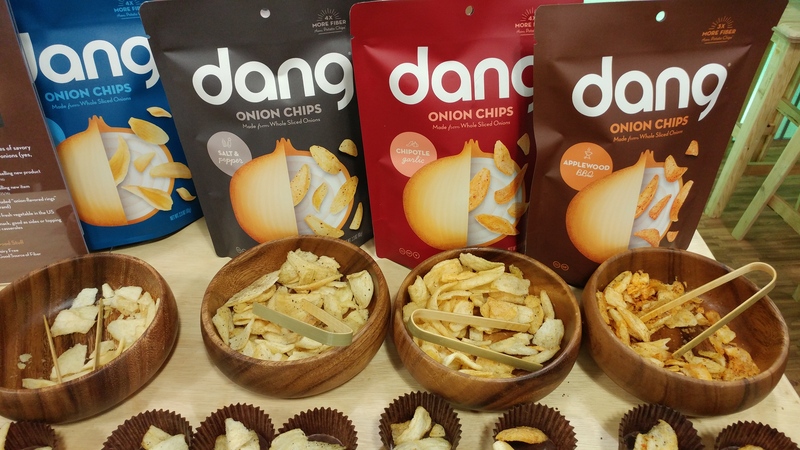 A sample of highlights from this January’s show include a most interesting line of products from Epic Provisions, all meat-based and using as much of the animals as possible, from pork rinds to beef tallow. The broad array of meaty products goes well beyond old-school jerky. And it echoes this recent study finding meat-based snack sales on the rise. 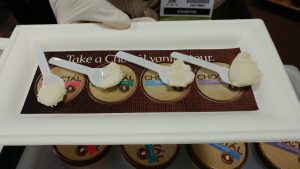 A vertical of vanilla ice cream…so delicious. And my prize this visit for not having my no-sweets blinders on was spending a few minutes at the Choctal table. Not only really outstanding ice cream. Really outstanding single-origin ice cream. So you don’t just pick up a pint of chocolate, you opt for perhaps Costa Rican chocolate, or maybe Ghana chocolate instead? They offer vanilla varietals as well: Indonesian, Mexican, Madagascar or Papau New Guinea. It inspires offering a flight of ice creams for a dinner party dessert some day…. Alas, neither of those two companies are on this year’s list of award winners. But a few items definitely caught my eye. As soon as I finish this post, I’m going to figure out where I can get a box of the Tarallo Tradizionale (straight from Italy) that won top prize in the “crackers” category. Taralli (the more commonly used plural form) are a simple and wonderful crunchy snack perfect for aperitif hour. I loved them so much on a trip to Italy a while back, I came up with a recipe to include in Salty Snacks. Now I’m hooked, picking up a bag most any time I come across them, most recently at Big John’s PFI, a version with rosemary I think it was. And I just found this recipe on Food52 that’s inspired by the recipe in my book, going with a tapenade-like flavor combination. Brilliant! At first glance, I was less enthusiastic about the gold level winner of the “savory snack” category. Though maybe taralli was just a hard act to follow!! Given how much variety in snack land these days, I wouldn’t have thought seasoned nuts an obvious standout. But to be fair, I haven’t yet tried them. Maybe the Everything Goes Nuts are all that and a bag of chips! (ha, ha, I crack myself up). I pretty much only eat bagels on New York trips, and it’s always going to be an everything bagel (with a schmear of scallion cream cheese and sliced tomato). So I may be surprised how much I love these award-winning nuts–almonds, pecans and cashews with an “everything” spice blend. I’ll be sampling them soon and will report back. Hot beverages don’t usually attract my attention (beyond that one critical cup of coffee each morning), but I was intrigued by the Millie’s Delight Pho sipping broth that won top honors in that category. A teabag-like sachet with dried vegetables, spices, and green tea is ready to steep as a reviving liquid snack. With my efforts this year to focus more on my health, this sounds like an ideal mid-afternoon option to have on hand for a pick-me-up. 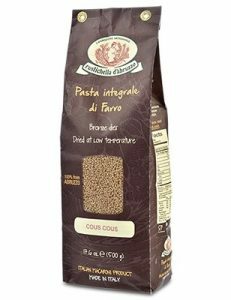 Last but not least on the list of winners that caught my attention was the couscous made with stone ground farro from Rustichella d’Abruzzo. We eat very little pasta or rice at my house, limiting carbs to suit my husband’s diet-managed diabetes. But grains we have pretty frequently, farro just this week in a simple asparagus-mushroom stir-fry with gobs of fresh ginger. I love this idea of taking farro into the couscous realm and could see this a regular in the dinner routine around here. Looks like I’ve got some shopping and snacking and cooking to do. That’s up next on the agenda.